OOTD - Black Maxi Skirt | La Petite Noob | A Toronto-Based Fashion and Lifestyle Blog. Oh Monday, why must you sneak up on us so soon? Coming off of a busy but incredible weekend, Monday is a tough pill to swallow. The weather has been amazing lately, and this weekend I took full advantage by spending the vast majority of my time outside. By the time Sunday evening had rolled around, I was feeling a little drained from spending so much time in the sun and needed a no-brain outfit to get me through the evening. Enter my trusty black maxi skirt, which I've worn before here during the winter, a simple white bustier-tank and some Ray Ban wayfarers that I borrowed from my husband's sunglasses collection. Finish off with a simple red lip and a messy low-bun - Sunday evening spent in simple style. Read on for additional photos and outfit details. 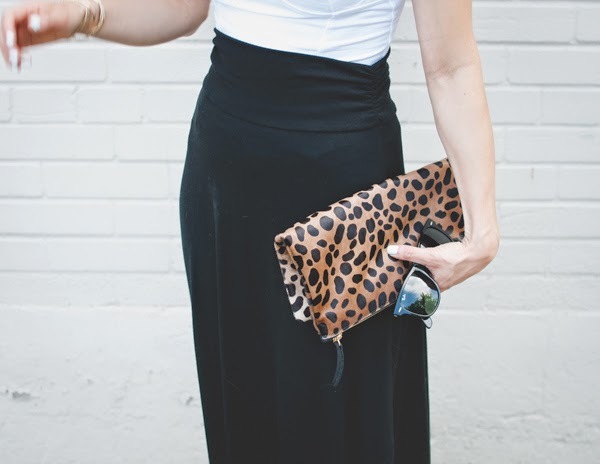 I really like this Clare V leopard fold over clutch. Like really, really like it. I had no idea that I would have gotten so much use out of it, but it seems to come with me anytime I need to add a little pizzaz to a simple outfit. Judging by how much I have enjoyed this clutch, I'm now on the hunt for another statement clutch - does anyone have any recommendations? Not the most flattering of photos, but you get the idea. How was your weekend? Did you get out in the sun? Let me know! I love the simplicity of this outfit. I'm also quite jealous at the way you can wear your hair in a messy bun and it looks like a nice updo. I still haven't mastered the nice/messy hairstyle yet. Lovely outfit! I felt totally drained because of the sun too, but all the time spent outside was worth it. Color-blocked clutches are great statement pieces. I especially like the ones where one side is one color, and the other a different color. That way when you fold over, you get both! Sometimes, it's like you're reading my mind. I'm on the lookout for a clutch JUST like that! Incredible! You look so elegant in this outfit! Those red lips just perfect the look. Red, black and white are always classics in my book! What I love about this outfit is that it is an easy way to look dressy but be casual, and it's SUCH an easy look to pull together. And of course, I can't say no to any Clare V clutch.